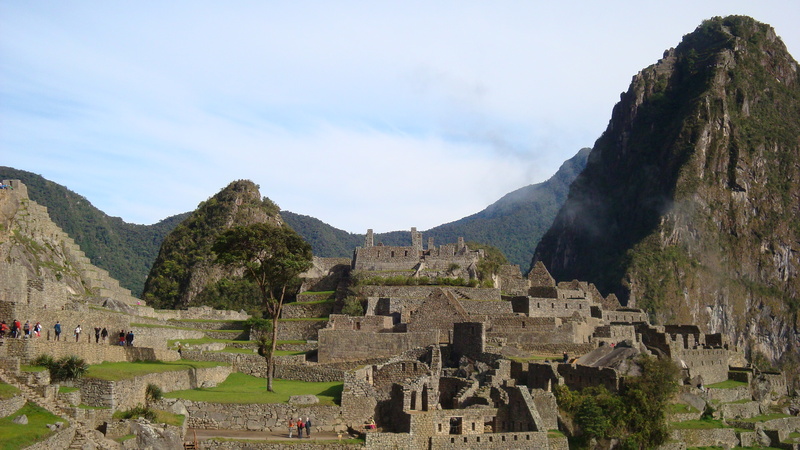 Back home from Peru…Lima, Cuzco, Machu Picchu – what a trip! We’ve been home for about a week or 2 now from our sojourn to Peru in October. We visited friends who have moved to Peru (from Africa), made empanadas and corn tortillas together, had a great visit with them, then we flew to Cuzco where we spent a few days before catching the train to Machu Picchu. 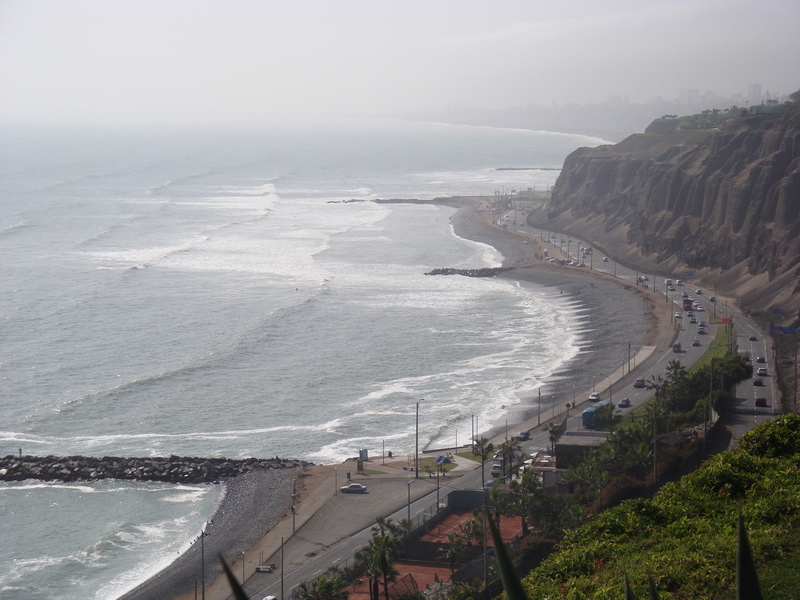 Lima is big, dusty, dirty, busy, full of people and traffic. Great shopping, however, compared to Ecuador, with wonderful clean and pretty organic markets, but a bit expensive. Majestic views from the cliffs near the ocean. OK, I could live here. 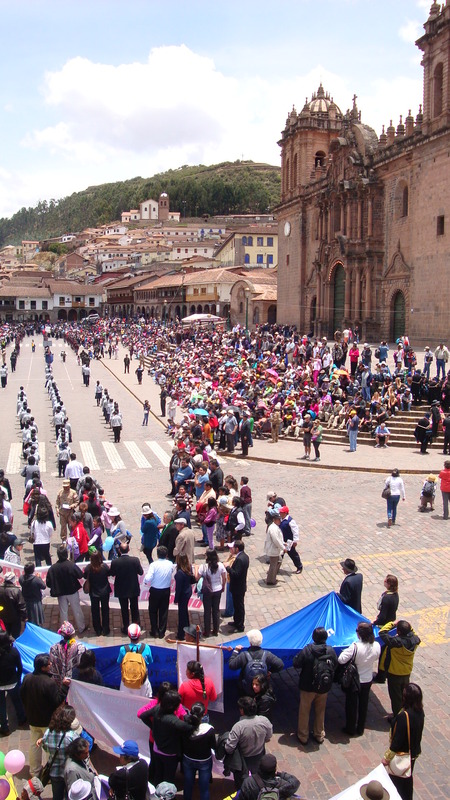 Cuzco is a wonderful little tourist town, 13,000 feet above sea level, and is the stepping off point before heading up to Machu Picchu by train or hiking the Inca Trail. The town boasts a 17th century cathedral, gorgeous views, pretty colonial buildings, lots of touristy places and things accessed by small streets lined with perfectly aligned Inca stones. Sunday we had front row seats at the 2nd floor Starbucks on the Plaza de Armas for a parade – military, students, nurses, unions, children, even older folks from a nursing home. They all bunched up to march, uniformly, for 1 short block in front of the cathedral and the dignitaries, after which they all drifted away on the other end of the block. The poor soul directing the marchers (the man in the beige uniform, looking at a list) had a difficult 3 or 4 hours; it was like herding cats, trying to keep them all in line! 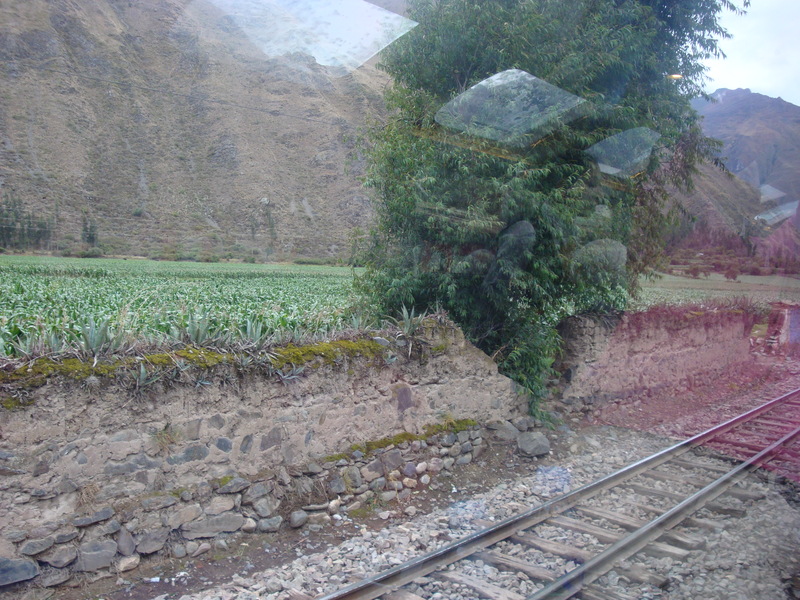 The train ride from Cuzco to MP City is a comfortable, scenic ride along the river from 13,000 ft (altiplano, dry, deserty) down to about 7000 ft altitude, as the scenery becomes, in turn, high plains with corn and sugar cane crops, which then becomes the jungle– with vines, orchids and almost constant views of terrace ruins, soaring granite cliffs peppered with flowering bromeliads, small villages and livestock. It was lovely. 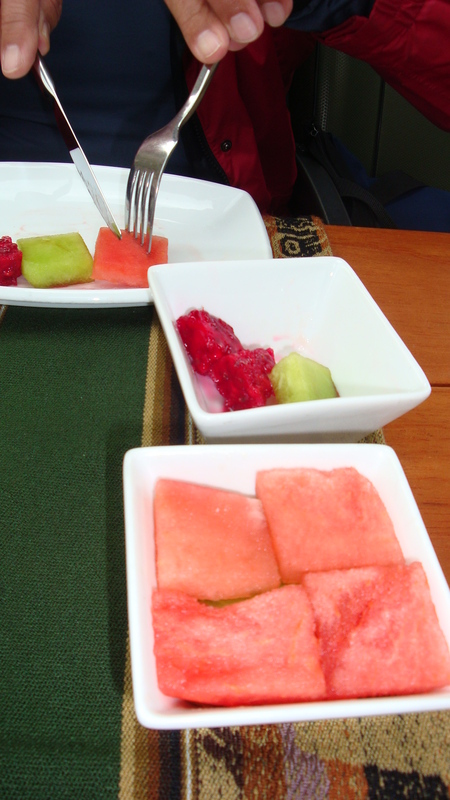 They even fed us on the train. We were fortunate to grab a peek at Monte Veronica in the distance and a few other snow capped mountains that drifted in and out of the clouds. 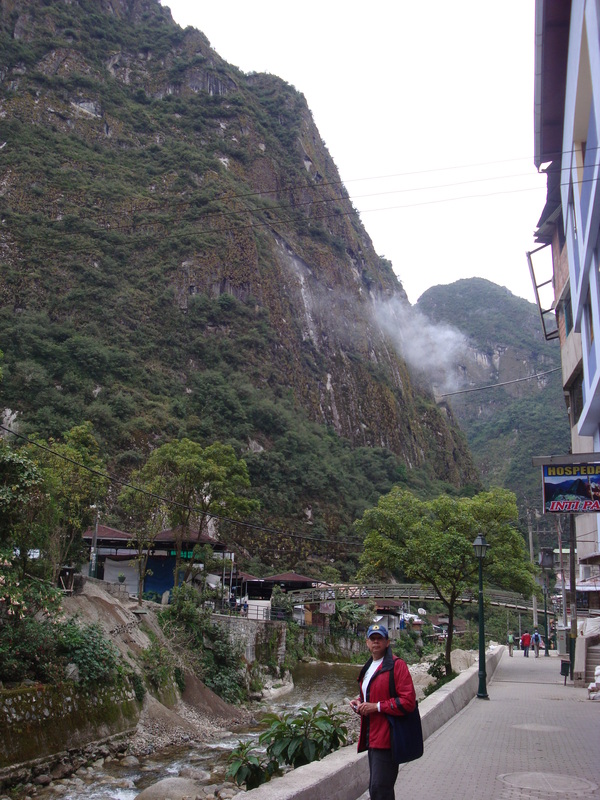 Macchu Picchu city is a cute little tourist town with great restaurants and lots of craft vendors where everybody has to start the trip to MP by taking a bus up to the site. No other cars are allowed in Macchu Picchu city except the buses that take you up the mountain. All food, crafts and supplies are brought in by the train. The bus ride is 20 minutes of sheer terror as the bus maneuvers the numerous switchbacks that cart you up the mountain to the site. Machu Picchu is magnificent. The granite cliffs that surround the site, the misty clouds that burn off by noon, the terraces that hug the hillsides, the steps and sacred places cannot be shared by just a photo, or even a video. You have to be there; you have to experience it. However, it is NOT for the faint of heart, and somebody like me with serious fear of heights is going to be extremely challenged. I was. I didn’t traipse around the entire site (hubby did) but I did get up to the site, I did manage to see most of it, and I can say, I’ve been there. 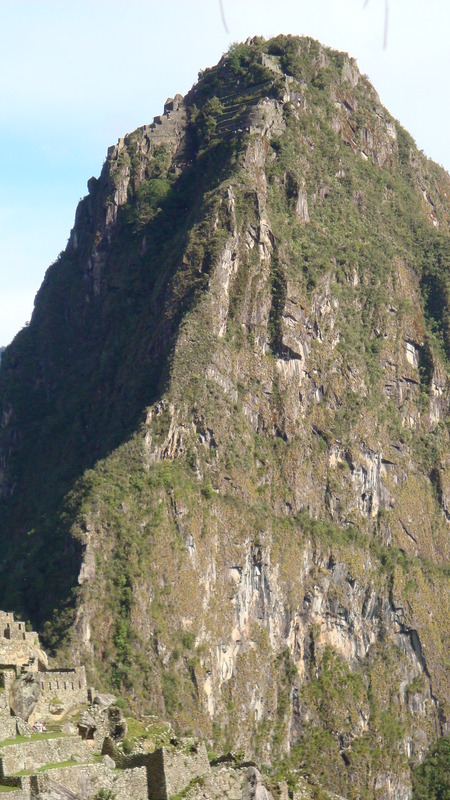 No way was I climbing up Huayna Picchu –I cannot believe anyone gets up there without falling off! Yes, there are actually people up at the top of that! I can now say I’ve been there. Hubby wants to go again! 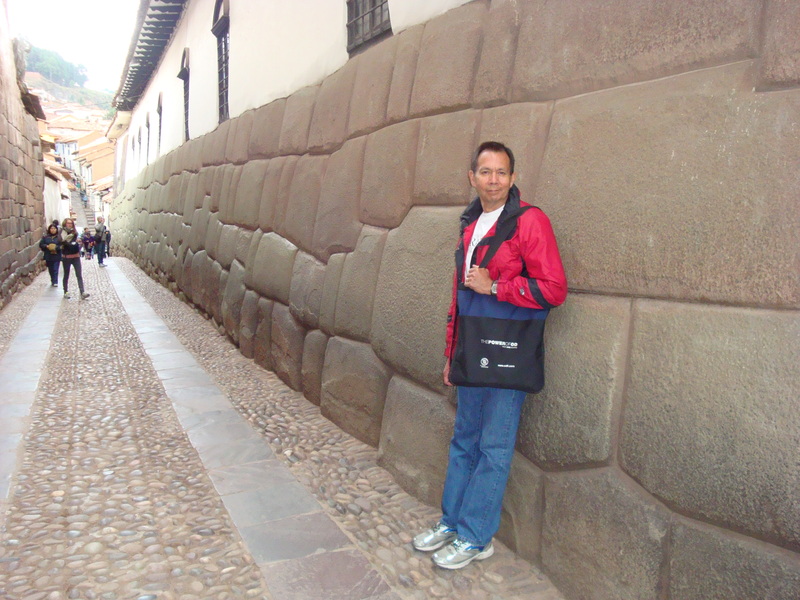 I’ll go to Lima (shopping), Cuzco, and even the train to Machu Picchu city, which I loved. I had the best meals there. Here’s a few pics of MP City and the meals I enjoyed. 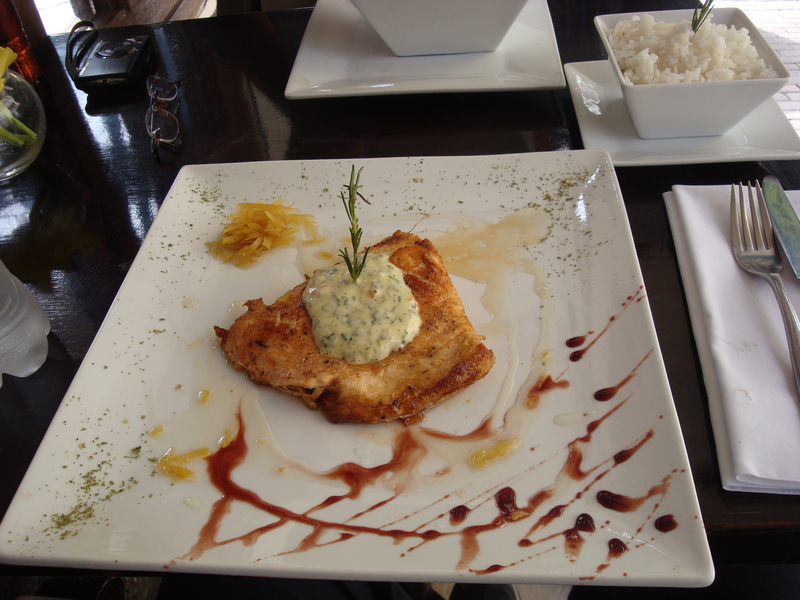 The waiter said it was trout, but it tasted like salmon. It was delish. Had the best time shopping, had a number of great meals, and the people were wonderful, too. 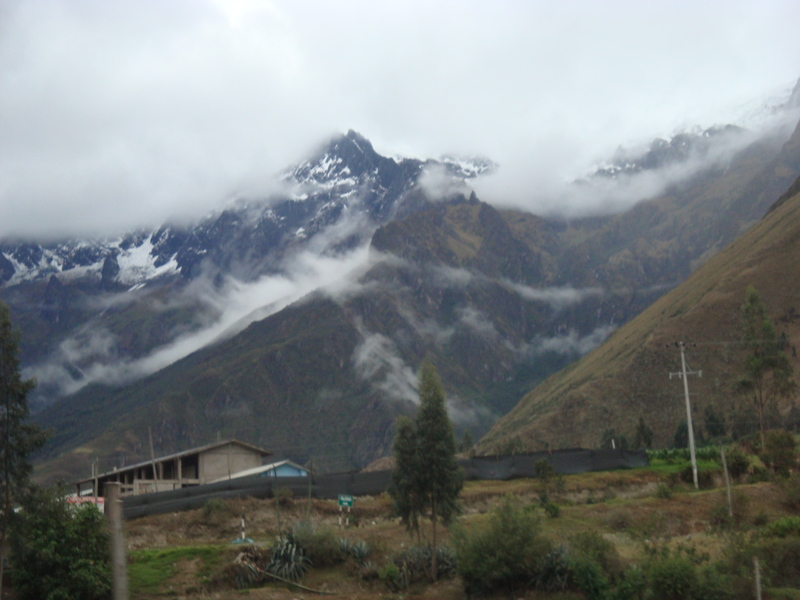 Of course, this little village depends on all the tourists who pass through on their way to the Inca experience. A few years back, the rains washed out the train and the road up to the site. No tourists were allowed to come for 4 months. I can’t imaginge how these people managed to survive, but it seems that they did. Next time, I think I may pass on ascending again to the heights of the Inca Holy site. I’ll stay down in Machu Picchu City. Loved it there. Next blog: Our shipped crate of 16 boxes has passed inspection in Guayaquil this week, and is supposed to arrive at our Casa next week! Yippee! it will be like Christmas. I am looking forward to your next blog. I am in the process of trying to decide if I am going to ship stuff, if so, what I will ship and how I will ship. I will be relocating from the Dallas Fort Worth area. I was even thinking of trying to piggy back my stuff with someone else’s. Any words of wisdom would be greatly appreciated. Well, finally. All settled in. For now. Baking and cooking around the world Fusion cooking, organic food, sampling food from around the world. Traveling is a gastronomical delight. Compassion International – helping children worldwide Change the life of a child in Ecuador – forever!